FcγRII proteins exist as six potential isoforms encoded by three genes, designated as A, B, and C. The reported molecular weight of these isoforms are variable between 37 and 43 kDa. All isoforms are similar but not identical in their extracellular regions. The cytoplasmic portion of FcγRIIA and FcγRIIC contains an activatory ITAM motif whereas FcγRIIB contains an inhibitory ITIM motif. Differential splicing of FcγRIIB gene yields to 2 isoforms FcγRIIBb1 and FcγRIIBb2. Monocytes carry all forms of FcγRII, neutrophils carry FcγRIIA and C. FcγRIIB is expressed by B lymphocytes and mast cells. 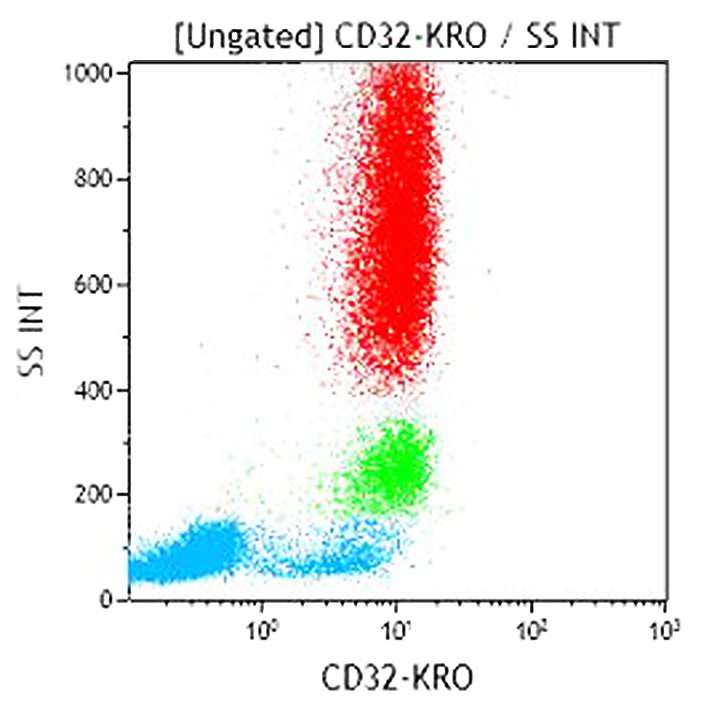 Clone Description The 2E1 antibody recognizes the antigen isoforms expressed on basophils, neutrophils, eosinophils, platelets and B cells.